It’s an exciting race for the top scorer competition of the amount of languages. 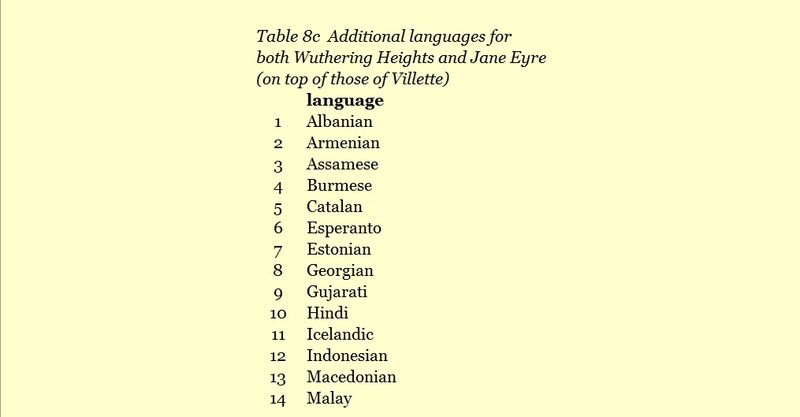 Wuthering Heights has taken the lead, with 51 languages. Jane Eyre has 49. But there must be more. As a comparison Lewis Carroll’s Alice in Wonderland can be given. It has 174 languages. Jane Eyre especially, who is almost as iconic as Alice, should be able to come considerably closer. It is interesting to note that Jane Eyre took a 11-1 lead in the 19th century, against Wuthering Heights. 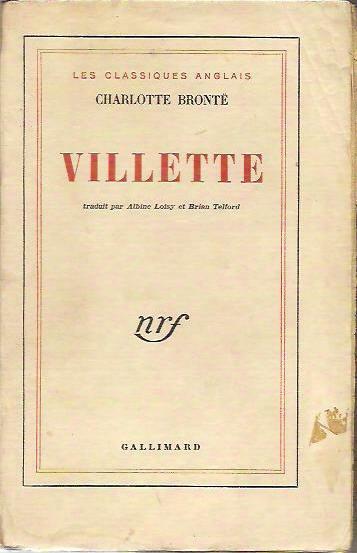 Villette is a very good third, with 31 languages. On fourth place come The Professor and The Tenant of Wildfell Hall, with 28. Shirley has 27. Agnes Grey is last, with 25. There will be more for them too. One would think that the amount of translated editions of The Tenant of Wildfell Hall, Shirley and Agnes Grey come close to the amount of The Professor (150). I would guess that there are at least about 2500 translated editions of Wuthering Heights and Jane Eyre, each. Of both braille versions have also been found, but, especially because they are in English braille, these cannot be regarded as translations. Update 29 December 2016. The latest scores are: Wuthering Heights 61, Jane Eyre 59, Villette 31, The Tenant of Wildfell Hall 30, Shirley 29, The Professor 28 and Agnes Grey 26. In tables 8a-e you can see all the languages that have been found. 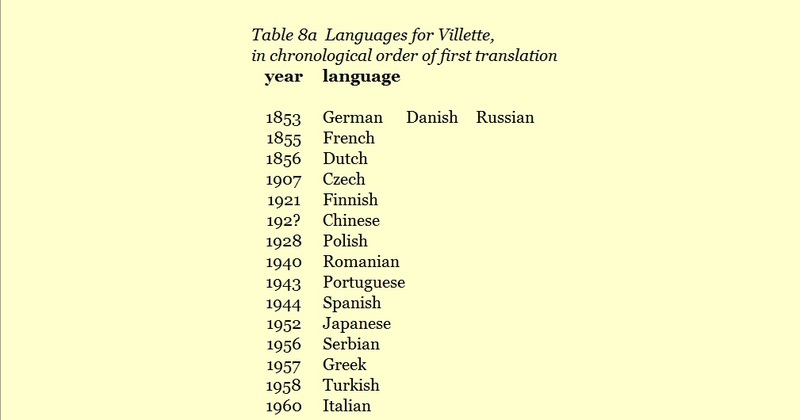 The first two tables have the year in which the first translations of Villette and The Professor in a certain language was published. The first translation of Villette in French after (the abridged) La Maitresse d'Anglais was published in 1932 by Gallimard from Paris. It got to a remarkable seven editions that year, and a very good total of 23 editions altogether in 47 years. The 1932 and later editions, up to the fifteenth in 1949, probably all had (almost) the same cover. The translation was done by Albine Loisy and Brian Telford. Loisy-Léger (1909-?) also translated George Eliot's Middlemarch, Adam Bede and Silas Marner, and wrote two novels herself. Very little could be found about Telford. The next editions that can be traced are the fifteenth and sixteenth from 1949. We don't know when exactly the eight to fourteenth editions were published. Gallimard introduced a new cover for the sixteenth edition. Nor can the 17th to 21st editions be found. The 22nd and 23rd were published in 1979. These covers couldn't be found too. The last one is said to be a facsimile reprint of the first 1932 edition. All these Gallimard editions seem to have had 630 pages. It may well be of course that there were only two different Gallimard covers, although there will have been more small variations. It is very remarkable and disappointing that so many editions are missing. 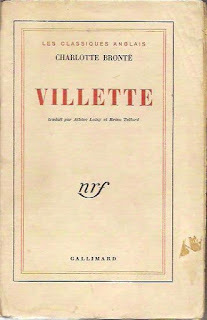 In no other country has a Villette gone missing, let alone a dozen. Having found nearly all translations we can get a good picture of how Villette and The Professor in time spread around the world. 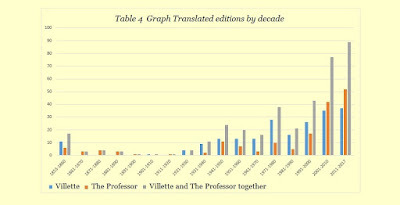 About half of the translated Villette and The Professor editions were published in the last 30 years. Some of these years have been very productive, although there have been remarkably good years earlier too. These best years, and decades, will be revealed below. 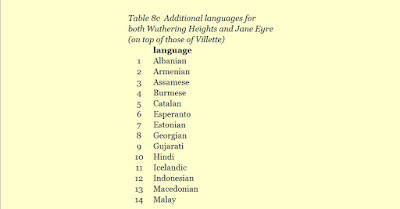 Among other aspects there is also a review of the total amount of languages for all of the Brontë novels. We’ll begin with giving the winning years. 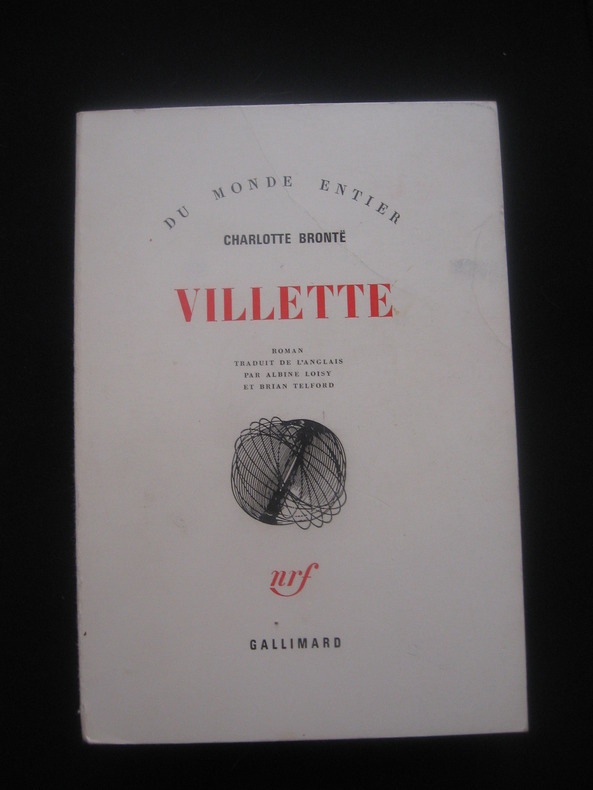 For both Villette and The Professor it was 2013, with 9 and 11 translated editions respectively. 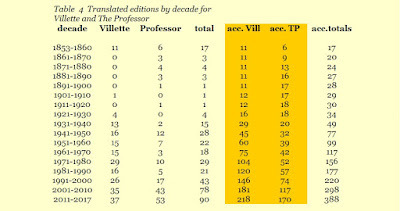 For Villette the years 1932 (thanks to one French translation) and 2011 come second with 7, while 1975 and 2008 come next with 6. In the The Professor competition 2016 is on second place with 10 translated editions, while 2005, 2009, 2014, and 2015 come joint third with 8. When the figures for both books are combined 2013 comes out as the clear winner, with 20. The years 2014, 2015 and 2016 are on third place with 13, followed by 2005 with 12. In tables 1, 2 and 3 more good years are shown for the novels in these competitions. Update, 6 January 2017: The year 2016 has taken the lead in the The Professor competition, it is now on 12 editions. The year has also moved to sole second place for the two novels combined, with 16 editions. The years show a clear trend. 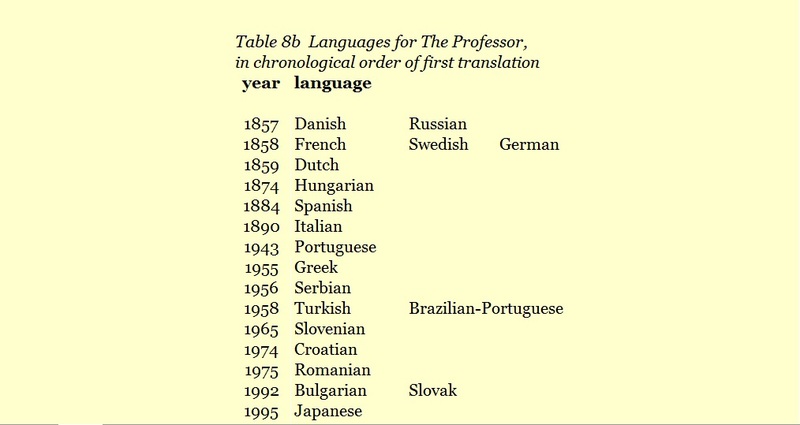 It started quite slowly, but the amount of translated editions first really started to grow in the 1940s. It has been a quite regular growth since then, as this graph shows, as well as the accumulated total of translations of both novels. At present it is 218 for Villette and 170 for The Professor. By 1920 The Professor had taken a 18-9 lead, but from then on till the end of the century Villette won every decade: 1920s, 4-0; 1930s, 13-2; 1940s, 16-12; 1950s, 15-7; 1960s, 15-3; 1970s, 29-10; 1980s, 16-5 and 1990s, 26-17 (Note: the year of publishing of 12 French Villettes is not known, 7 are from between 1933 and 1948, 5 between 1950 and 1978, these have been divided here over these 5 decades in this count. Three unknown editions of The Professor have been given to the 1940s, the 2000s and 2010s). In this century The Professor won the first decade, 43-35, and is in the lead in this present decade, 53-37. It is remarkable that this present decade is already the best scoring one, with more than 4 years to go. In table 4 the full figures for the decades are given, and they're also shown in the second graph. In the 1970s the score of translated editions more than doubled in comparison to the previous decade. It was the great leap forward for Villette. It is an interesting phenomenon that the novel owes much here to Eastern European, then communist countries. Out of 27 editions, 19 were published there, divided over 7 countries. Serbia was a clear winner with 7 Villettes. Croatia came second with 4. Germany is third with 3, with two from East Germany. The communists continued to show more interest in the 1980s. They had a majority in languages and editions. But Germany was the winning country, West-Germany, with 4. 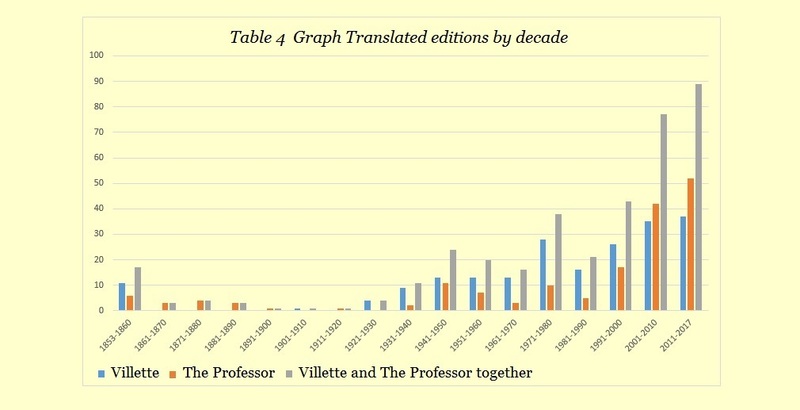 Remarkably, two years had no translation of Villette or The Professor at all, 1981 and 1988. The only other year to do that since 1943 was 1954. Although communism fell in eastern Europe in 1989 the countries continued to dominate the statistics, with Villette majorities in the amount of languages (9 out of 15) and editions (16 out of 26) in the 1990s. It was helped by a Chinese edition, still a communist country. Russian was the individual winner, with 5 editions. German is second with 4. Russia scores a resounding victory in the 2000s, with 15 Villettes! The Netherlands come second with 3. 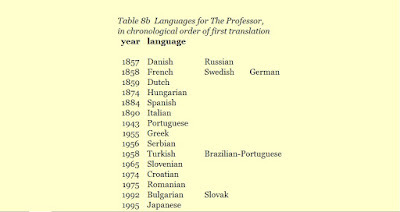 The decade has 11 languages, and 34 editions. 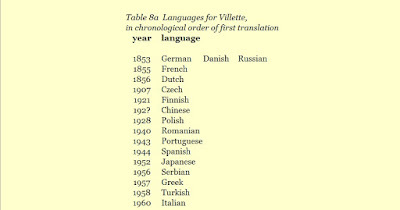 The 2010s have already got 17 languages for Villette, and 37 editions as well. Russian has taken a lead. It’s on 6 (editions). Italian is on 5 and Brazilian-Portuguese have 4. 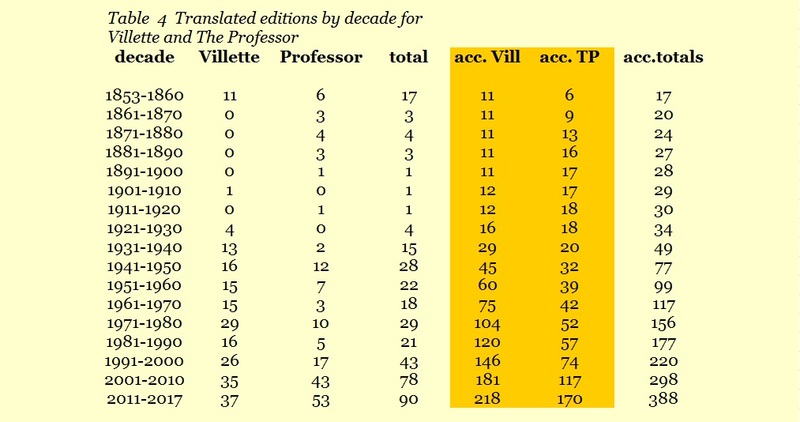 Table 5 gives the winning decades for both novels together, tables 6 and 7 give the Villette and The Professor results. The Dutch language scores a resounding victory in the competition of the most different translations of Villette. It includes one translation that is probably Flemish. It has 7. Germany and France have 5, Italy has 4. French is the winner in the race of languages with most editions, with 39, followed by Russian with 30. Germany has 20, Dutch has 12 and Hungarian is fifth with 11. Russia appears to have the best running single translation. It got to 27 editions! Henriette Loreau is easily the winner in the longest running category. Her French translation of The Professor was first published in 1858, and last in 2016. That's a near-perfect score of 158 years! Tyyni Haapanen-Tallgren is on second place with a splendid 96 years with her Finnish Villette (1921-2017). Róża Centnerszwerowa comes third with 74 years, with her Polish Villette (1939-2013). The first man is on fourth place. Gaston Baccara is on 68 years with his French Villette (1945-2013). It will be very interesting of course to see what the score will look like in 40 years time. Women easily win the translator competitions, as could be expected. They have most translations and editions. One translation was done by two men, the Arab Villette. Its cover drawing, joint nr. 1 in the cover top 6, was made by a woman, Safwa Farid, I recently learnt.